I started this blog as a way to keep in touch with loved ones across the globe, as well as to give myself a special place to call my own. I was in a transitional stage in the fall of 2007, with changes coming from every direction, and I needed something to keep my feet on the ground and to help me find contentment in my situation and myself. As I've also mentioned before, a million and one things have changed since then, and it's been a wild ride that doesn't show any signs of stopping. What's beautiful about where I sit today, amidst an exciting and spontaneous life, is that I'm very happy. I have a completely different sense of self than I did at newly 21, I love my life and the changes that I've consciously put into motion, and I feel in control and ready for anything. I'm so glad that this blog has been along for the journey, and since moving to Boise where the dust of life has settled a little, so has my blog. I love writing posts more than ever, be they about food, fashion, life, love, or anything in between, and it's been awesome to start to mold this blog into a cohesive site that reflects who I am and what I'm up to. It's been pretty incredible, as much as I try not to get caught up in the numbers, to watch my readership grow. A few months ago, I had never commented on or followed another blog, published my URL on other social media sites, or put myself out there to anyone besides close family and friends. When I started writing posts more frequently and following other blogs, I watched my page views go from 1,000 in October to over 18,000 today, and I gained a few followers along the way. While this pales in comparison to many blogs out there, to me, it's a little victory that feels wonderful and that I'm honored to celebrate. Writing these posts is that much more special because it means there's a chance that someone out there is trying a recipe or project I've written about, or at least finding enjoyment in a post. It's equally great to have found other blogs that I look forward to reading, women who I feel like I could be friends with in "real life," and sites that inspire me. I want to thank each of you for reading and commenting on my blog. I truly appreciate your support, have loved reading your blogs, and look forward to sharing this crazy blogesphere with you for a long time to come! 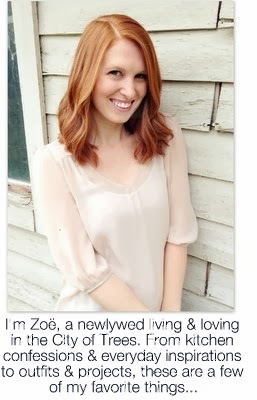 HIII Zoë love! You are amazing! Reader for life right here. Keep up everything, especially your beautiful smile! This was a great post! I know exactly what you mean. I love meeting new bloggers and connecting with them on a regular basis. It becomes so much more than a typical stop by, friendships are developed. : ) Love your site! I love this post. I've been blogging for almost 3 years, but it wasn't until this year that I truly got the "real" hang of it. Since then I've come across great blogs, like yours, that I love visiting and I've built some pretty cool blogger relationships! The blogging world truly can be great!